Although basilisks, griffins, and phoenixes summon ideas of myth and lore, they are three of several fantastic beings displayed in a Christian context. From the anti-Christian Roman emperor Diocletian to the legendary Knights of the Templar, a variety of unexpected subjects, movements, themes, and artists emerge in the history of Christian art and architecture. To get an idea of its scope, we mined The Oxford Dictionary of Christian Art and Architecture for information to test your knowledge. Headline image credit: St Peter’s facade. Photo by Livioandronico2013. CC BY-SA 4.0 via Wikimedia Commons. 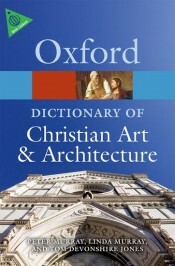 Tom Devonshire Jones, Linda Murray, and Peter Murray are the editors of The Oxford Dictionary of Christian Art and Architecture. The late Peter Murray FSA and Linda Murray FSA were well-known art historians with over 30 years' teaching experience, and several books written in collaboration, as well as those written independently. Peter Murray was Professor of the History of Art at Birkbeck College, in the University of London, from 1967 until his retirement in 1980. Linda Murray taught art history in the University of London Extra-Mural Department from 1949 to 1979. Tom Devonshire Jones studied Classics and Theology at Oxford, always with an eye on the art of Antiquity and Christianity. Since ordination in the Church of England in 1960 the interactions of art and religion have been a significant focus of his parish and campus ministries in England and the United States. He is the founder of Art and Christianity Enquiry, and he is married and lives in London.